Apple Watch / Wearable tech? ^Sweet! It's looking like I'll be able to get 2 days out of a charge on mine as well which is neato. I seem to drain a lot of battery at night tossing and turning so chances are i'll either use power reserve at night or just take it off. do you use power reserve at all? 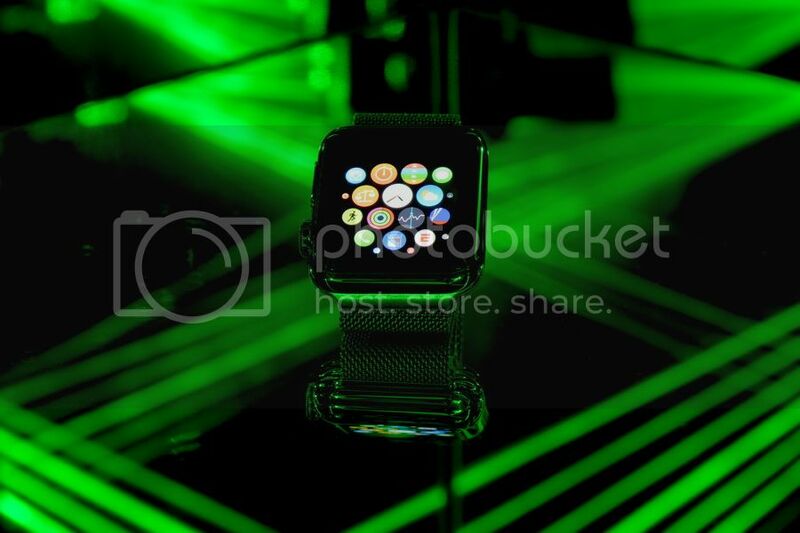 Nice shot Bruce, looks like a "laser wall" around the watch. I'm not a huge fan of smart watches mainly because charging can be annoying, though with the one I have it's great. I have the original Pebble Steel and it's a great watch, the e-paper display can give up to 5 days of battery life on average but it has gone to 10 days a couple times. Best part is it takes around 30 mins to get to a full charge. Hey Electro, yes it is a pain to charge it every night, but it is now part of my routine. My wife has a Fitbit and it lasts 3 or 4 days. Now as well as your position on earth and your direction and speed your biometrics can be tracked, heart rate, skin temp.....It has a camera and microphone too I'm sure. We are becoming one with the machine, part of the collective, resistance if futile. No camera, but it does have a mic (& speaker) to take phone calls on your watch if your phone is close by. Eventually they will make the watch cellular and more self sufficient and less reliant on being tethered to an iphone. What is also cool is I can control all my Phillips Hue lighting in my house from my watch. I personally haven't had much interest in that. I personally never wear a watch as I almost often have my phone with me which does all the things I need it to so no real need for me! I don't buy into Apple products specifically because they are a closed system. I'd rather invest in an open source project like Android where anyone can download and develop the SDK free of charge. Additionally, the lab where I work that thing would be destroyed in seconds, most laboratories don't even allow electronics as such. For the chemist, a watch like this is more suitable. Soon... I reckon that technology might be more google glass like though. What it would need is some system to read brainwaves instead of voice commands and buttons. This might seem pretty far off, but it actually is not. There are already systems that allow you to enter letters just by looking at them, using the flash rate of each letter and ECG measurements to do that (so no eye-tracking involved at all). Currently they need electrodes all over the head to work well, but perhaps that could be reduced to something like a bandana with enough signal gathering to send basic commands. On the other had we could just implant a chip in the brain and be done with all that fuss - any volunteers? Getting easily a day out of one charge so far, usually end a day with it at about 50% and it charges in an hour. Useful for tracking how (un) fit I am. With me having the white sports strap it's rubbish for any kind of dirty work, I was digging around in the engine bay of my car earlier and thankfully had the foresight to take it off. If I hadn't I suspect I'd still be cleaning the strap a year from now. I think with one of the metal straps you could get down and dirty with one though, especially given the stainless steel is now waterproof and has the virtually scratch resistant sapphire glass. My 1st edition watch has the Sapphire glass and stainless steel casing. In over a year not one scratch on either .The Milanese steel band is the most comfortable and precise watch band I have ever owned. When I purchased the watch I also purchased the light blue sports band for when I am going to sweat and get dirty. I have not used that band in months because the Milanese is so comfortable and is easy to clean. This technology is not based on (f)MRI scanning but on te humble old EEG with some serious processing power. At the moment it still requires a few dozen electrodes placed all over the scalp, but using that people can complete some simple tasks by thought alone already. I doubt poepe would be able to get much done with current MRI technology really as the constant stream of load dubstep music emitted from the scanner is distractive enough. The EEG route is not that bad though, if people are willing to strap a VR goggle onto their face to do something, a EEG 'helmet' of sorts may not even be that much to ask, especially if built into one device. I have to go for an MRI soon , the idea of sticking my head in a small tunnel when I'm mildly claustrophobic is not pleasant! I wish they had invented a way to "read my brainwaves" already! !